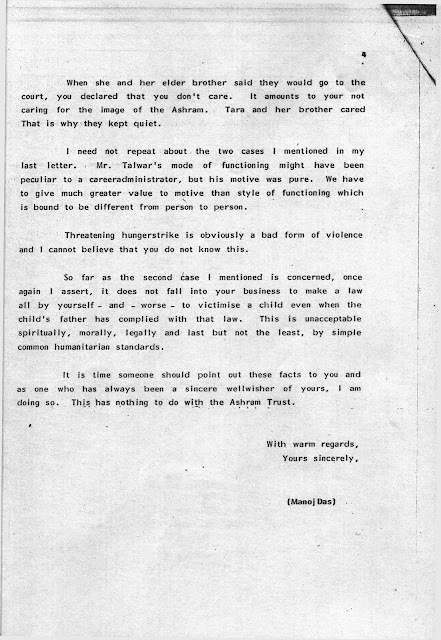 Thank you for your prompt response to my letter of 13-06-94. But I wish that you were not that prompt - had taken some time to reflect or meditate on the content of my letter dispassionately. It is easy to be rude, to try to snub somebody or even succeed in silencing somebody through threats, but such gestures do not solve an issue. It should be also easy for me to stomach your gestures and avoid certain discomfitures, but that will not solve any issue either. Had the Mother left an instruction that whatever you say or do must be taken as the Word or Act of Providence, I will bow down to all such words and actions. 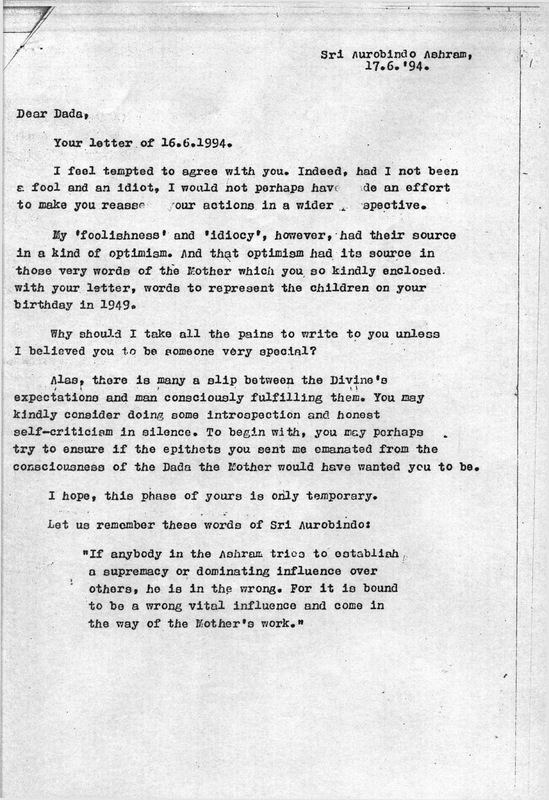 Short of that, I must feel, with all my common sense and my emotions supported by whatever little knowledge I have gathered as a student of the Mother and Sri Aurobindo that what appears arbitrary and illogical in someone's decision has a greater truth behind it. I remember once when I had a discussion with Nolini-da on a certain issue where my view was opposite to that of his. He heard my arguments with calm and courtesy and revealed the truth behind his stand in a few words. That day I realised how the Divine can vibrate through a human disciple. I do not mean a comparison. Everyone is unique. But, again, short of the two positions mentioned above, any decision has to stand the test of reason - not mechanical reason - but sensitive reason. You ask me to mind my business. During the first 29 years of my stay in the Ashram, I never stepped out of my business in the Ashram and I never found any reason to murmur about anything. I am not stepping out of my business now either, but the sphere of my business has expanded in a natural way. But I sincerely wonder, are you strictly minding your business? Are you not overstepping them? 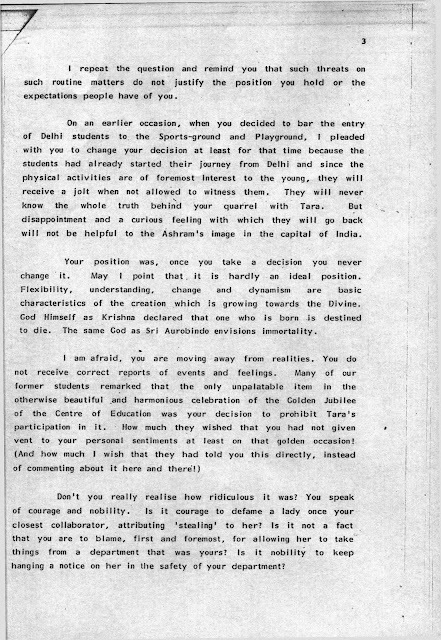 I can never forget how discourteous you proved to Harikant-ji, the Managing Trustee of the Ashram, when very politely he requested you to remove a notice from the Ashram notice board concerning the Auroville School. Your notice highlighted a passage from an Auroville document in which the Auroville administration was trying to rectify a certain indiscipline in their school. That was their internal matter and if anything, they were trying to improve on the situation. To pounce upon it and to use the Ashram noticeboard (any notice-board in any part of the Ashram complex) to show their deficiency, is something beyond anybody's business and does not speak of refinement. 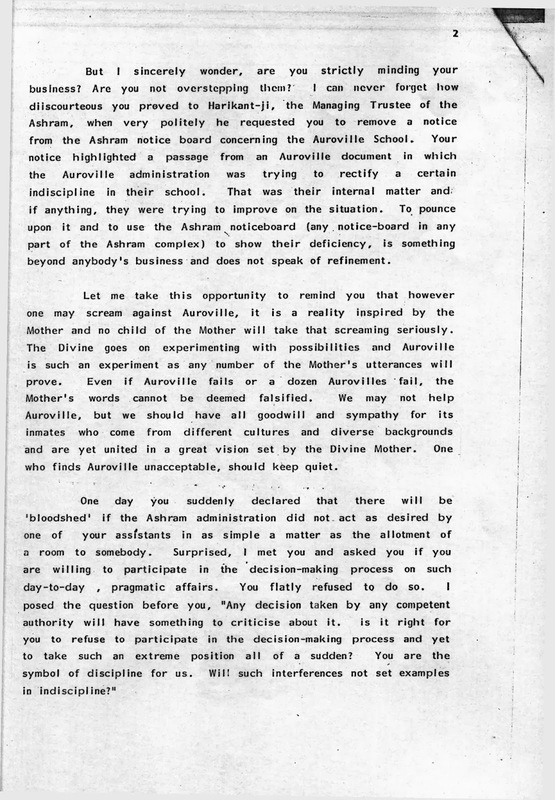 Let me take this opportunity to remind you that however one may scream against Auroville, it is a reality inspired by the Mother and no child of the Mother will take that screaming seriously. The Divine goes on experimenting with possibilities and Auroville is such an experiment as any number of the Mother's utterances will prove. 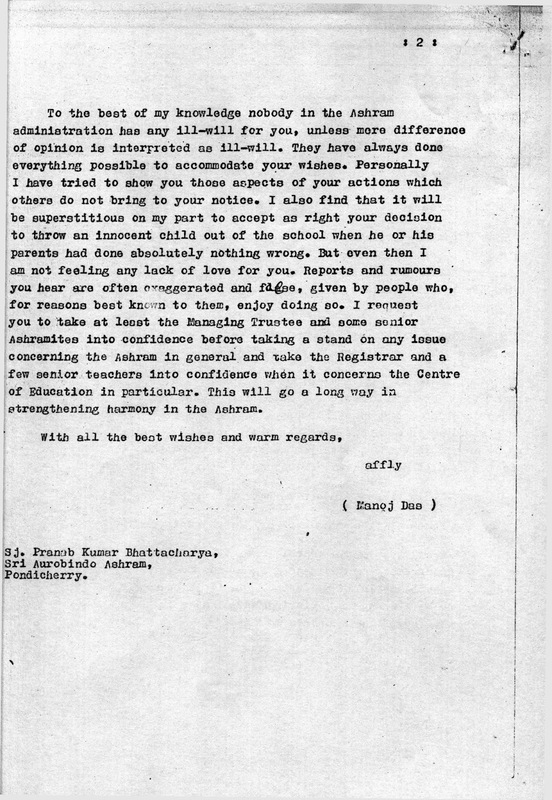 Even if Auroville fails or a dozen Aurovilles fail, the Mother's words cannot be deemed falsified. We may not help Auroville, but we should have all goodwill and sympathy for its inmates who come from different cultures and diverse backgrounds and are yet united in a great vision set by the Divine Mother. 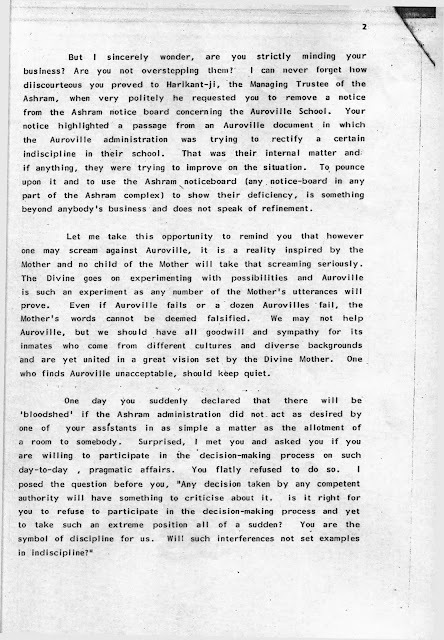 One who finds Auroville unacceptable, should keep quiet. One day you suddenly declared that there will be 'bloodshed' if the Ashram administration did not act as desired by one of your assistants in as simple a matter as the allotment of a room to somebody. Surprised, I met you and asked you if you are willing to participate in the decision-making process on such day-to-day, pragmatic affairs. You flatly refused to do so. I posed the question before you, "Any decision taken by any competent authority will have something to criticise about it. Is it right for you to refuse to participate in the decision-making process and yet to take such an extreme position all of a sudden? You are the symbol of discipline for us. Will such interferences not set examples in indiscipline?" I repeat the question and remind you that such threats on such routine matters do not justify the position you hold or the expectations people have of you. 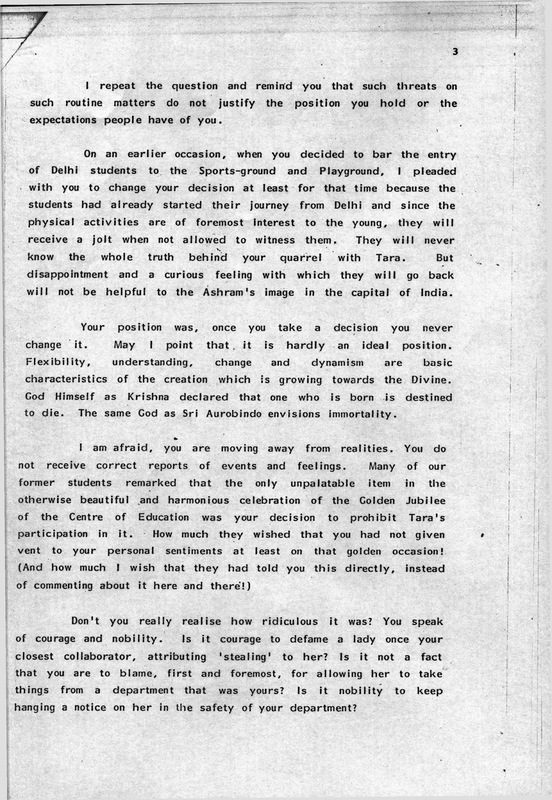 On an earlier occasion, when you decided to bar the entry of Delhi students to the Sports-ground and Playground, I pleaded with you to change your decision at least for that time because the students had already started their journey from Delhi and since the physical activities are of foremost interest to the young, they will receive a jolt when not allowed to witness them. They will never know the whole truth behind your quarrel with Tara. But disappointment and a curious feeling with which they will go back will not be helpful to the Ashram's image in the capital of India. Your position was, once you take a decision you never change it. May I point that, it is hardly an ideal position. Flexibility, understanding, change and dynamism are basic characteristics of the creation which is growing towards the Divine. God Himself as Krishna declared that one who is born is destined to die. 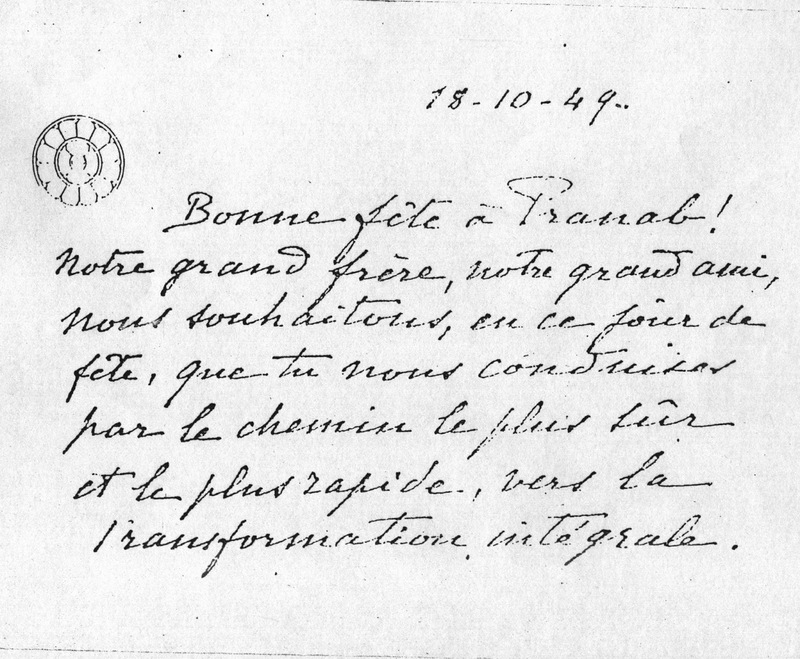 The same God as Sri Aurobindo envisions immortality. Don't you really realise how ridiculous it was? You speak of courage and nobility. Is it courage to defame a lady once your closest collaborator, attributing 'stealing' to her? Is it not a fact that you are to blame, first and foremost, for allowing her to take things from a department that was yours? Is it nobility to keep hanging a notice on her in the safety of your department? When she and her elder brother said they would go to the court, you declared that you don't care. It amounts to your not caring for the image of the Ashram. Tara and her brother cared. That is why they kept quiet. I need not repeat about the two cases I mentioned in my last letter. Mr. Talwar's mode of functioning might have been peculiar to a career administrator, but his motive was pure. We have to give much greater value to motive than style of functioning which is bound to be different from person to person. Threatening hunger strike is obviously a bad form of violence and I cannot believe that you do not know this. So far as the second case I mentioned is concerned, once again I assert, it does not fall into your business to make a law all by yourself - and - worse - to victimise a child even when the child's father has complied with that law. This is unacceptable spiritually, morally, legally and last but not the least, by simple common humanitarian standards. It is time someone should point out these facts to you and as one who has always been a sincere wellwisher of yours, I am doing so. This has nothing to do with the Ashram Trust. 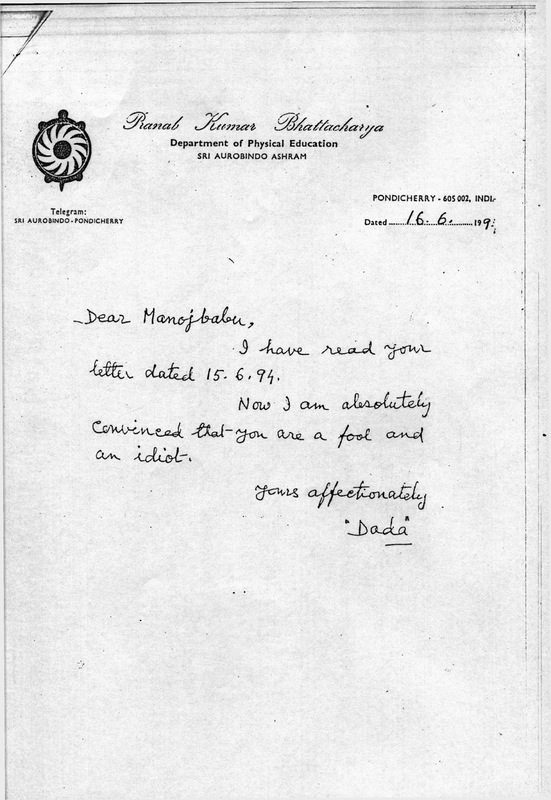 I have read your letter dated 15.6.94. Now I am absolutely convinced that you are a fool and an idiot. I feel tempted to agree with you. 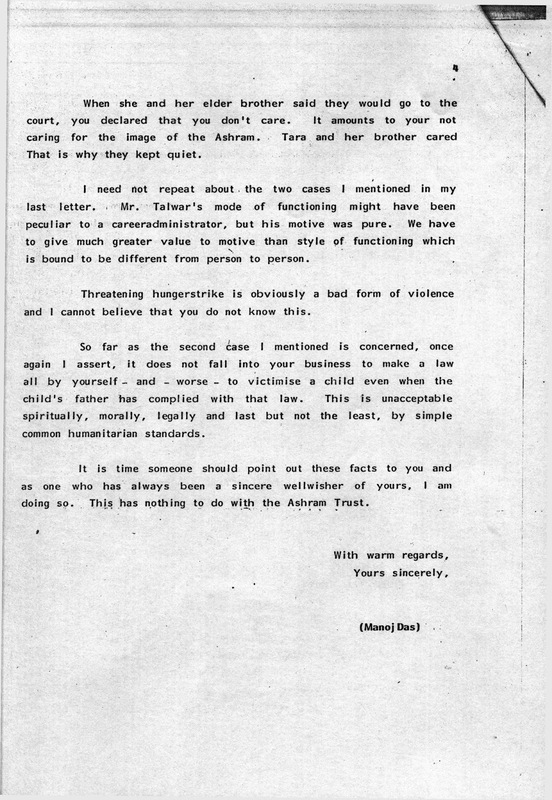 Indeed, had I not been a fool and an idiot, I would not perhaps have made an effort to make you reason our actions in a wider perspective. My 'foolishness’ and ‘idiocy’, however, had their source in a kind of optimism. 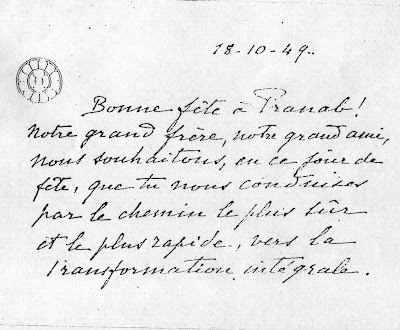 And that optimism had its source in those very words of the Mother which you so kindly enclosed with your letter, words to represent the children on your birthday in 1949. Why should I take all the pains to write to you unless I believed you to be someone very special? Alas, there is many a slip between the Divine's expectations and man consciously fulfilling them. You may kindly consider doing some introspection and honest self-criticism in silence. 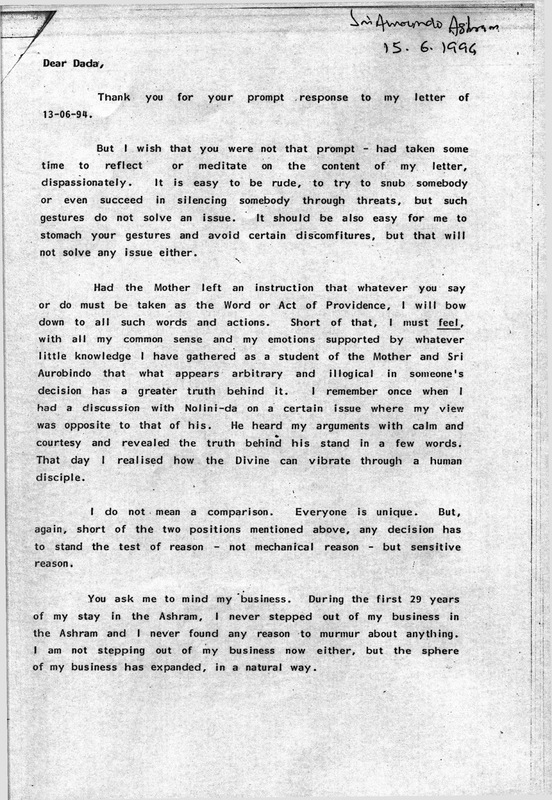 To begin with, you may perhaps try to ensure if the epithets you sent me emanated from the consciousness of the Dada the Mother would have wanted you to be. I hope this phase of yours is only temporary. "If anybody in the Ashram tries to establish a supremacy or dominating influence over others, he is in the wrong. For it is bound to be a wrong vital influence and come in the way of the Mother’s work." To the best of my knowledge nobody in the Ashram administration has any ill-will for you, unless mere difference of opinion is interpreted as ill-will. They have always done everything possible to accommodate your wishes. Personally I have tried to show you those aspects of your actions which others do not bring to your notice. I also find that it will be superstitious on my part to accept as right your decision to throw an innocent child out of the school when he or his parents had done absolutely nothing wrong. But even then I am not feeling any lack of love for you. Reports and rumours you hear are often exaggerated and false, given by people who, for reasons best known to them, enjoy doing so. I request you to take at least the Managing Trustee and some senior Ashramites into confidence before taking a stand on any issue concerning the Ashram in general and take the Registrar and a few senior teachers into confidence when it concerns the Centre of Education in particular. This will go a long way in strengthening harmony in the Ashram.